In observance of Mother's Day, I'd like to share (in Oprah-ish fashion) things I've become most certain about when it comes to motherhood. We already know it's a lot of hard work. And that it will surprise you with the amount of love you never knew existed in your heart. 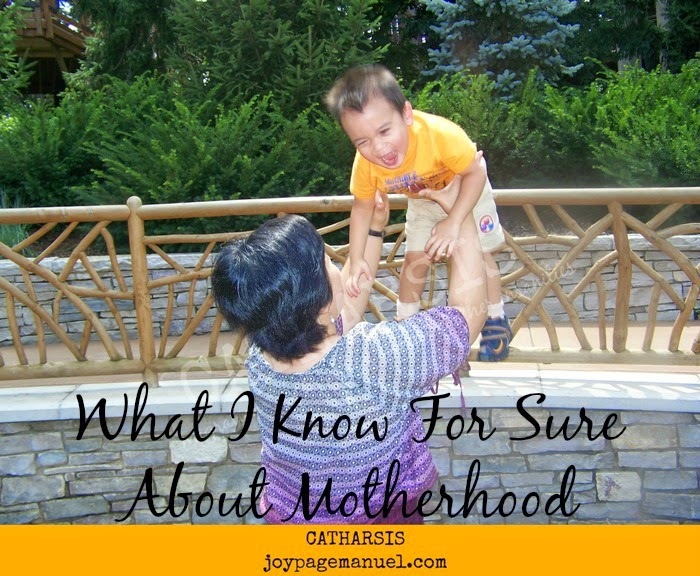 But beyond those obvious things, what else have become true for me which I am willing to bet are likely true for a lot of other mothers as well? There's no one-size-fits-all—unless it concerns child safety or health, and existing recommendations are backed by science (e.g. vaccinations, sleep safety, car seat safety, etc). My point is that there is no reason to torture yourself by worrying too much about guidelines on when or how to take away the binky, how long to breastfeed, how to carry or bond with your child, when to potty train, what sleeping arrangements work, or whether or not your child will be permanently damaged if you let him watch some television. We're really all just winging it and much of it depends on our specific situations. What has worked for one family may not be the best for yours. Use commonsense and ditch the beeyatch friend who keeps judging your choices and makes you feel inadequate by perpetually sounding like a talking American Academy of Pediatrics Handbook. Childbirth automatically raises your pain threshold. The pain you felt giving birth becomes the ultimate standard by which all other types of pain shall be measured against. When you step on broken glass and end up with a gaping wound, you say, "Bah! This is nothing compared to when I felt as if my body was being literally split in half!" In the same token, your grossness tolerance is exponentially increased. As is true for most mothers, we're the ones relied upon when it comes to clean up—poop, pee, nosebleeds, earwax, snot, throw up, you name it! Of course we don't enjoy it but who else would do it? I once attended a party where one of my single friends threw up after drinking too much. She felt too ill that she ended up just laying on her bed. I went to assist her with the trash can as she continued to throw up and one of my other single friends asked, "How could you stand that smell? It makes me want to throw up too!" My answer was brief— "I'm a Mom". Your life will be consumed by plans, routines, schedules. It's the only way to survive and keep your sanity. From coming up with a birthing plan, to feeding schedules, doctor's appointments, planning birthday parties, playdates, vacations, laundry, mealtimes, trips to the grocery store, as well as when YOU can pee, poop and take a shower—you will find that everything requires a lot of time organization and following routines in order to accomplish tasks...and to keep looking and smelling human! You will gain weight and go through some degree of self-loathing. You'll regret all that wasted time in the past when you hated your body and thought you were big. But don't worry. If you're lucky (and almost all of us are!) you'll have a child that will always tell you the truth that you are perfect and beautiful just as you are, squishy and simply divine. It's inevitable that thoughts of your own mother will come to haunt you. When you become a mother yourself, you ponder on your own childhood and the kind of mother you had/have. You will think of things that worked and want to emulate, and things you hated and swear you'd never turn into. You will remember the grief you gave your own mother and shiver at the thought of karma always finding its way. Most of all, at least for most of us, you won't be able to help but regress to your young self needing TLC every time you are sick and need that comforting touch only your mother could give. You will be plagued with self-doubt. Because you know this is the most important job you will ever do, you will keep asking yourself, every step of the way, if you're being good at it. However, you will soon realize that 'good enough' is a good place to be in. You need to be comfortable with it, be friends with it, and know that the objective is not to raise someone perfect, just someone who knows how to love. I don't care how much you love and adore your children, but when you're a mother, the highlight of your day becomes that time of night when you can sit quietly on your couch or bed, let out a deep sigh of relief and have alone time. A remote control on one hand and a consumable treat on the other (think chocolate, or wine) are priceless and highly encouraged! If you forget your own dreams, daily reality—yours and others'—will torment you. You will end up resenting everyone around you and everything will just feel unbearable. You have to find something outside of motherhood that will nurture your spirit and offer growth. This is not selfishness. It's commonsense. If your spirit feels replenished and cherished, this energy has no other choice than to overflow into all that you do and the roles you play. If you feel like an overused and neglected empty vessel deep down, you will be incapable of seeing joy around you, and time spent with your family will only feel like a duty, a burden, rather than a gift. You may not need an entire village, but a small reliable tribe is always great to have when you're raising children. Never take for granted the amount of assistance you have available to your family. As a migrant whose family lives on the other side of the globe (and my husband's side lives in a different state), we don't have the privilege of having extra hands who are truly trusted, reliable, and not to mention, free-of-charge, when it comes to childcare or any type of family assistance. Having sitters who are strangers to us is an alien concept for me culturally, and so this is something that my son is strongly averse to. Going on a couple's date is a huge production number that takes a lot of planning and impeccable timing, often times involving my best friend's family. Every two or so years, my mom manages to visit from the Philippines and the three or four months she spends with us are priceless! I feel like those are the only times when I'm allowed to get sick, go out on dates and lay off the kitchen somehow to let her take over on certain days. That's my opportunity to taste Filipino dishes I can't cook myself and which I want my son to be familiar with. So if you have family close by, loved ones you can trust so that you can take brief, needed breaks from being 'mommy', consider yourself blessed and make sure you are grateful. Not everyone is as lucky as you. I would love to hear what you know for sure! I am honored, Rena. Truly I am. Thank you so much!!!! And I hope you and your daughter had a special day yesterday! This is exquisitely written! Such astute gems of beauty and truth. I know you're probably missing your own mom a lot through your child's growth and development. Happy Mother's Day, my blogging buddy. You sure have a way with words - - that's WHAT I know for sure! ps. Loved the 5th one down. My son thinks it's such fun to keep poking my squishy arms and watching the indentations. Grrrrr..... Gotta love it! This was Stephanie btw, in case it doesn't identify me. I have trouble with your comment sign in all the time!!! I love these! The part about sitting quietly is so true! Ahhh yes, OR with a remote control ;-) Hope you enjoyed your Mother's Day, Susan! Thanks! I hope you had a wonderful Mother's Day, Joy! I agree with every single thing you wrote here. I laughed about the pain threshold - I always tell the dentist that he can't hurt me, I've had two babies! You're a fantastic mother Joy. Happy Belated Mother's Day!